CLEVELAND, January 29, 2018 - The Lubrizol Corporation's Engineered Polymers business announces it will exhibit at the 2018 Northwest Materials Show in Portland, OR from February 7-8, at booth #901. Lubrizol will feature its innovative lineup of polymer solutions including Estane® TPU, Estane® TRX, BounCell-X(TM) TPU, Pearlbond(TM) TPU, Pearlthane(TM) ECO TPU, Estane® VSN TPU, Esdex® TPU and X4zol-J(TM) fiber technology. This broad product offering represents a single, convenient and reliable source with multiple products and technologies working together to solve the toughest application challenges in apparel (fibers, breathable films, seam tapes); footwear (hot melt adhesives, textile coatings, midsoles, outsoles, coated yarns); and eyewear (frames, lenses). Estane TRX TPU is an innovative rubber replacement for footwear outsoles. Rubber compounds have been the traditional choice for athletic footwear outsoles based on its well-balanced traction on dry and wet ground conditions and abrasion resistance. However, the interest in alternative options has increased due to the labor and energy intensive, multiple step rubber process and high scrap rate. Estane TRX TPU combines the benefits of rubber-like traction properties with improved processing via the thermoplastic injection molding process. In addition, Estane TRX TPU offers superior abrasion resistance and clarity in comparison to rubber compounds. Lubrizol is also offering other innovative technologies for footwear based on its industry leading TPU-chemistry, including BounCell-X TPU, the high performance TPU foam technology for footwear cushioning, Pearlbond TPU, the solvent-free TPU hot melt adhesive technology for component assembly, Pearlthane ECO* TPU, the renewable-source based (non-food competing) TPU for footwear components, and Esdex TPU resins and X4zol-J fibers for footwear upper constructions. 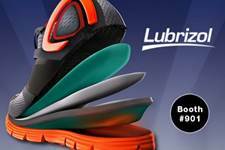 With footwear relevant innovations covering upper, cushion, outsole and assembly process, Lubrizol has become a total footwear solutions provider. For apparel, Lubrizol will showcase a revolutionary elastomeric fiber, X4zol-J, bringing innovation to the performance apparel industry. X4zol-J fiber is made from a proprietary thermoplastic polyurethane (TPU) resin and is available exclusively from Lubrizol and its Innovation Alliance Network for circular, warp knit and denim fabrics, and seamless garments. Fabrics with X4zol-J offer balanced stretch and recovery, comfortable compression and breathability, for exceptional wearer fit and comfort. Applications for fabrics with X4zol-J include athletic apparel, base layer, athleisure, intimate apparel, shapewear, socks and stretch denim. with brands and supply chain participants to understand their needs. We're looking at markets and applications in new ways, from materials to the combination of properties and design needed to deliver differentiated performance and aesthetic appeal. We're studying how and where products are produced, consumed, and also considering end-of-life issues. By looking throughout the value chain for opportunities to innovate for customers' enhanced automation, performance and sustainability, we're focused on adding real value and helping our customers with the issues that matter most. We believe this more holistic approach to innovation will yield many more significant developments. We continue to develop the people, capabilities, technologies, partnerships and operations needed to make that a reality."